As you edit photos on your computer and rearrange them across folders, the number of duplicating images inevitably grows. Slight retouching here and there, this one is original and this one is grayscale, this photo is cropped while that one is not. Sounds familiar? Then it is time to clean up your photo library of unnecessary duplicates. But don't worry, manual sorting and deleting is out of question. DuplicateHunter does the entire job for you. Here is how it works, step by step. 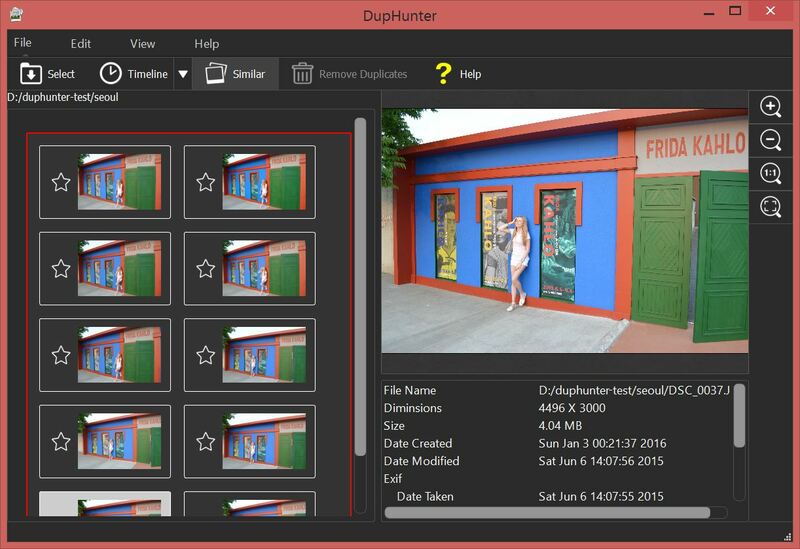 Run DuplicateHunter and click the Select button on the toolbar to add all folders where you store pictures. Thanks to an advanced image recognition algorithm, DuplicateHunter is able to locate similar images quickly and precisely. The app detects the duplicate even if the image is rotated, scaled, cropped or an effect is applied to it. To enable the search for similar images, select the Similar mode on the toolbar. DuplicateHunter arranges images it suspect to be duplicates into groups, each group holding one set of resemblant photos. Well, that was easy. Now the hard part. For each group you should select one or more photos that you want to preserve. The favorite mark indicates the chosen photo, and the green frame around the group indicates this particular duplication issue is resolved. The right-side preview window allows you to examine a photo in all details necessary to make a decision. Note that you can use zoom in and zoom out buttons. The preview window also displays important information about the photo: date and time the photo was taken, file size, dimensions of the photo in pixels, DPI and some other EXIF information. As soon as you finish selecting the best photos in your library you can start cleaning it up. Review your selection once more and click the Remove duplicates button on the toolbar. All duplicates will be moved to trash. 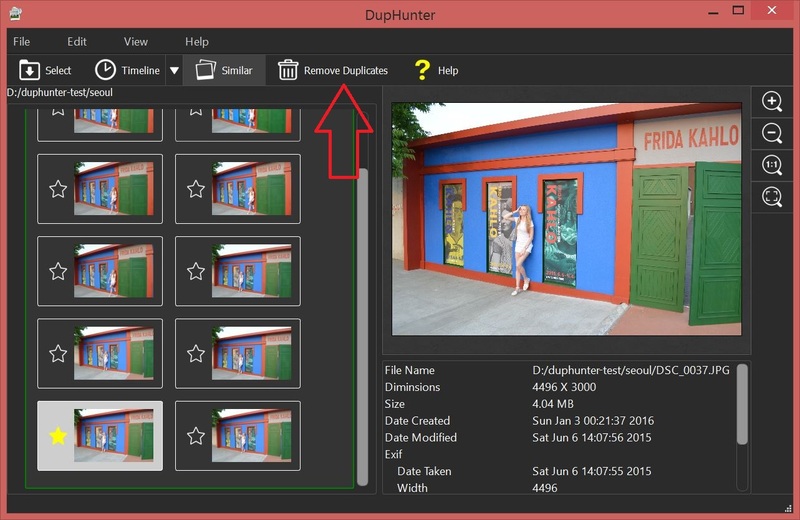 Finally, it takes a few minutes for DuplicateHunter to clean up your library from doubling photos in all resolved groups. And that is it! Download the free trial version and check how to find duplicate and similar photos.